The body is a remarkable thing – in fact, it’s so remarkable that it can often keep going with small strains and imbalances that develop so slowly we hardly notice them. The shoulders in particular can be an area where tension can creep in and undermine flexibility, even causing injury over time. Luckily, there are ways to keep a check on your shoulder health before problems develop. 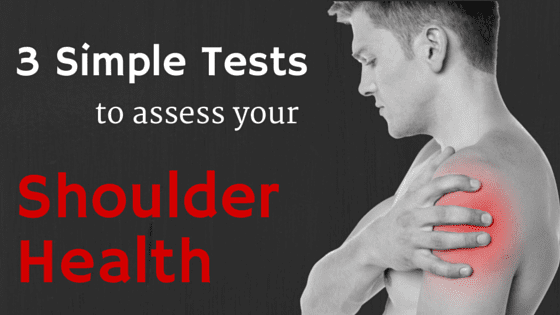 You can try the following simple tests at home without any equipment to assess your shoulder health. Lie flat on the ground or a firm surface with your thumbs resting on the floor beside you. Now bring the hands and arms up and back behind you as far as possible. While doing this, maintain a flat back without arching off the floor. This exercise can reveal restriction in the shoulder blade or joint itself, leading to imbalances in your range of motion. If one shoulder blade rises off the floor more, or one arm seems to reach further more easily, this is a clue that there are uneven restrictions in one or both of the shoulders. The “windshield wiper test” is a great way to evaluate your shoulder joint’s rotation range of motion. Lie on your back and position your arm away from the body with your elbow and shoulder bent at 90 degrees, with the hand pointing up towards the ceiling. First, rotate the arm as far back as possible, then as far down as possible, mimicking a windshield wiper. Most people should experience some restriction of motion going down, but a healthy range is for a movement of about 70 degrees. A good idea is to place the opposite hand on the shoulder to feel if it’s lifting off the ground as you rotate forwards. The last test can be done standing and is achieved by simply placing the hand behind the back without letting the shoulder roll forward. This assesses your internal rotation of the joint. Reach fully to the mid-back and then place the opposite hand on the shoulder to feel for any pulling forward. Then try the same on the other side – the key is that both sides should be equal. These three tests are simple enough to do at home, but they can reveal tiny imbalances and tensions that can develop into problems later on. If you’ve discovered some unevenness in your shoulders, checking in with a physiotherapist can help you rectify the imbalance. Very often, more serious injuries can be traced back to minor imbalances that were lurking in the background, unnoticed. Even if you aren’t experiencing any pain, a quick assessment with a physiotherapist can put your mind at ease. If you noticed any restrictions or differences from side-to-side, you’ll want to come see us! Call the clinic today at (780) 980-5443.